That’s me. Do you see me? I’m the Flash Green one there. I’m the Volvo V70 R. Whooooosh. Bye there. You missed me. I was flying fast under the radar, understated speed. Lots of people think that if they’re gonna be fast they’re going to be big loud grumble brumble umble rumble muscle cars engines sticking out of their foreheads. Squeeee goes the supercharger. Shakoom goes the big block. Others think that speed means a howly sports car’d existence. But not me. I’m an arrow of velocity, blitzing past your every early-warning watch station. You never even noticed me until I was gone, tall taillights gleaming in the distance. Five cylinders abuzz, I slot from gear to gear. That’s right. I’m a manual. Look on in the window, I know it looks like an automatic. But no, it’s a six-speed with a clutch. I have nearly 300 horsepower. I have all-wheel drive. I have Öhlins shocks. I have blue gauges. I am a blur with a set of dresser drawers in the back. I am not what you thought. I am just what I am, and that existence is speed. 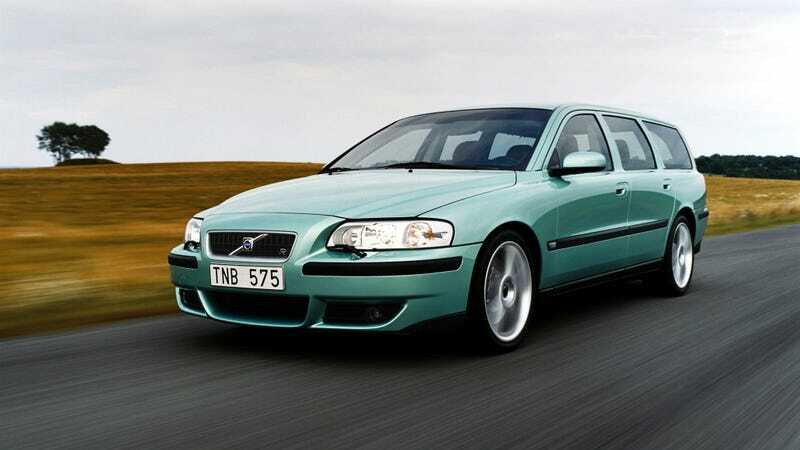 At $7,999, Could This 2004 Volvo V70 R Feed Your Need For Swede?